Earlier this summer I went to the Jack Daniels distillery. I have never partaken in whiskey before, we bought a bottle of their Tennessee Fire and I've been enjoying it slowly. Actually really good and the spicy kick feels like a Goldilocks situation where it isn't too much or too little but just right. I'm still enjoying some sour beers/Goses. As usual the Illinois local beer Destihl makes some great sours, just recently tried both the Blueberry Gose and the Lynnbrook, liked the Blueberry a lot and Lynnbrook only some. Off Color Brewing does some collaborations with the Field Museum here in Chicago, including one I'm going through now that's Chicha de Molle inspired ale called Wari. Pretty awesome stuff that tastes like beer with some sour fruit in it, hard to describe! I was also lucky enough to take a trip to Cincinatti and discovered Rhinegeist beer. Sadly it isn't sold in Chicago, but they make a whole range of some pretty great beers which I got to try a flight of at their distillery. My favorite was Press Tart, a collaboration with a nearby arcade bar that's a fruit beer, but the Peach Dodo, Semi Dry Hard Cider, and Bubbles were all great too. Meanwhile in other alcoholic beverage news, a friend of mine is currently on a cruise and I was insanely jealous of the ship's spiked milkshake menu she showed me, so I made my own: peanut butter frozen custard, milk, creme de cacao, and raspberry schnapps, whipped together in the Magic Bullet vibeblender. Delish. I picked up a bottle of Fernet Branca, and have been trying to find cocktails that it meshes well with. I had a drink last time I was in Phoenix that combined mescal, Fernet Branca, Fernet Vallet, and lime juice, and it was a smoky beast. I don’t have the bar to recreate that at home, but I’ve tried some simple substitutions. So far the best I’ve found is switching out a quarter of the Campari for Branca in a Negroni, which amplifies the juniper without being consumed by mint and cough syrup. Anyone have some good recipes for these weird bitters? I’ve been experimenting with this, and have come up with a good holiday drink that includes Fernet Branca. Mix together with a ton of ice. Pour into a glass lined with chocolate syrup. The Fernet complements the sweet chocolate, since they both would overpower the drink on their own. 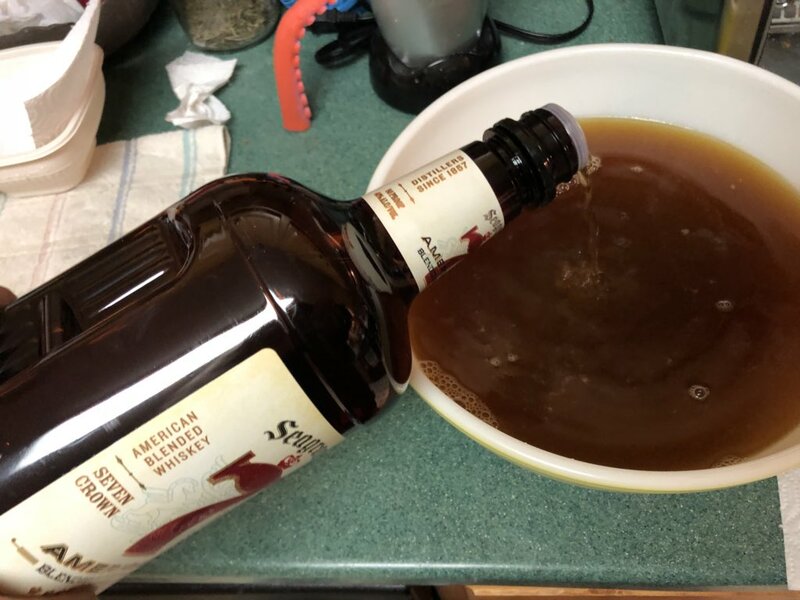 Up the recipe and put it into a punch bowl, and you’ve got a party. Where at? Undertow or something? I haven't been there yet. No, this was at the lobby bar at the Renaissance downtown, I think it’s called Dust Cutter. I love UnderTow though, their menu is on point. For non Phoenicians, UnderTow is a tiki bar built out of the oil change pit in an old service center. Its decor is the hold of a 19th century clipper ship returning from Polynesia, with portholes and barrels and tiki everywhere. It’s dark and cool, and if you go in the summertime, after a couple potent rum drinks you’ll forget that it’s 110 degrees upstairs. Take a Myst-like tour on their website though they have the lights on so you can see the details. Tonight I had a kitchen adventure that could really go in "Brag about what you cooked" as well, but it *is* ultimately a drink, so.. 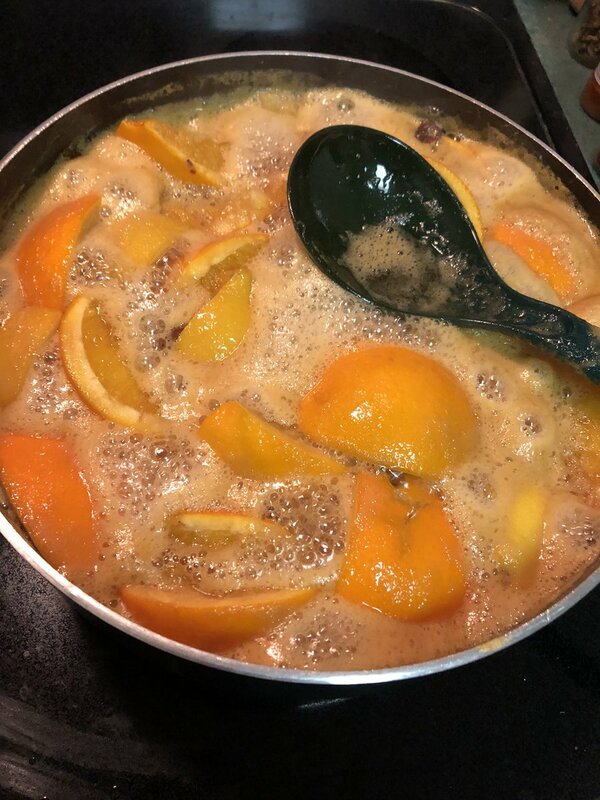 This is Boilo, an old family recipe from a friend who didn’t have time to make it this winter. It’s delicious. Goes great in hot tea. 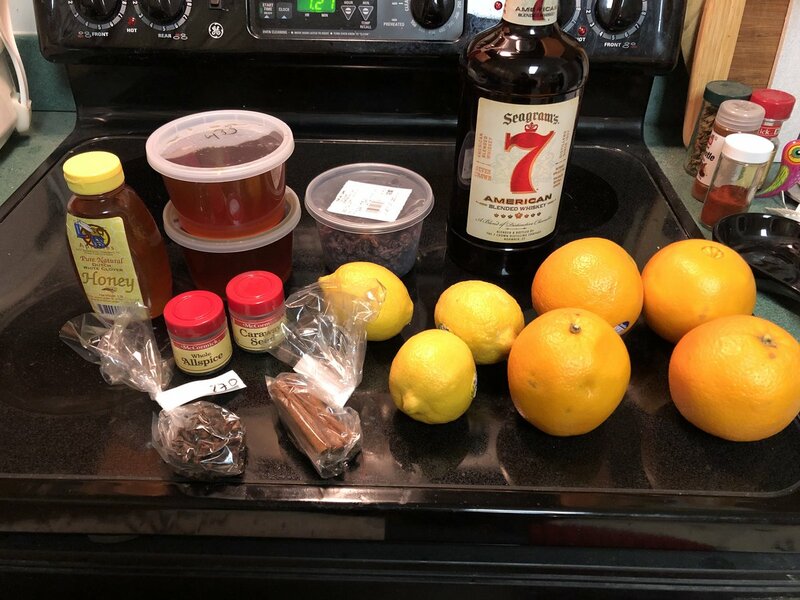 Used half a gallon of whiskey and like 70 freakin ounces of honey, in addition to a ton of fruits and spices. My whole dang kitchen was sticky afterward. Worth it. 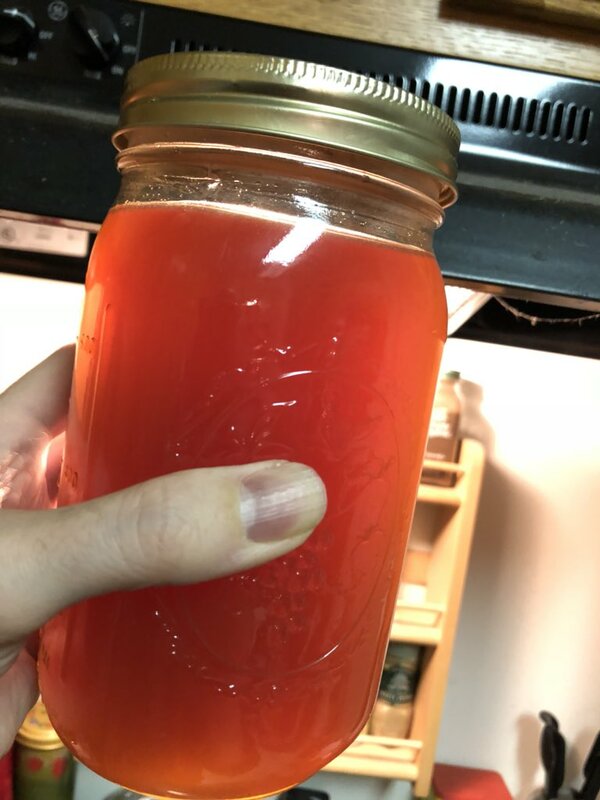 This batch will last me ages, even after I give a quarter to the friend who gave me the recipe and another quarter to other friends probably. I mean I dunno if I'm at liberty to paste in the actual family recipe, but it's pretty much all there in the pics and I'm sure you can make up your own variations of the exact spices and fruit. 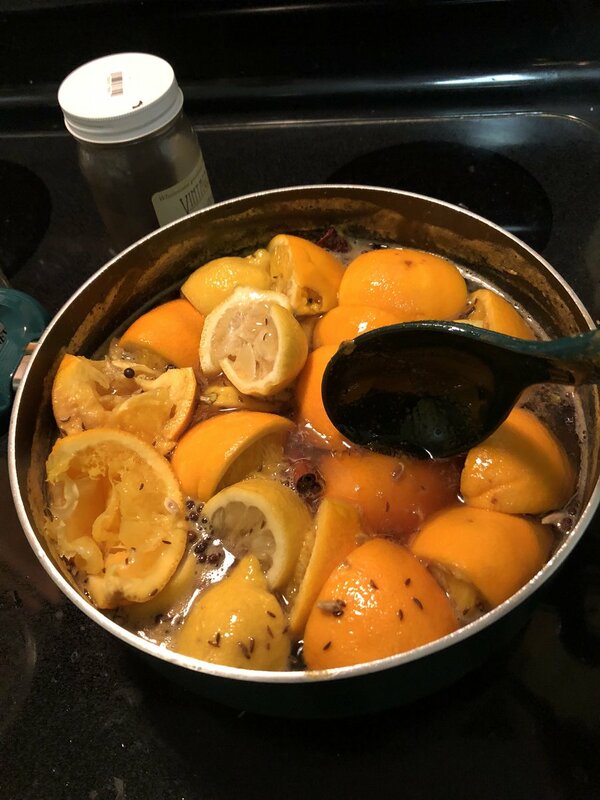 Basically you boil everything *except* the alcohol for at least half an hour (there's like a nominal pint of water to thin out the metric shitload of honey, but you also end up with a ton of fruit juice in there - you wanna quarter and squeeze the citrus but then dump the whole bits in as well). Then obviously strain it all and add a ton of whiskey. Divide into containers, cool and refrigerate. My kitchen smelled fantastic every time I walked into it for the next day. I wanted a lighter cocktail with a bit of a kick last night, so made a Mule variation. Mezcal, ginger beer, St. Germain, dash of celery bitters. If I had cucumber it would've gone perfectly as a garnish. The elderflower sweetness balanced out the smoky and sharp mezcal and ginger, and the celery bitters was just to make it fancy. Hitting up every bar in the county looking for which one makes the best Whiskey Sour! Frozen mango mohitos are delicious, ideally served on a cruise ship in the Caribbean. That is all. The original Coca~Cola, minus the coca leaves for obvious reasons. Plane travel was a mess yesterday due to fallout from Sunday’s snowfall in Chicago, and my itinerary was diverted through Denver, with a 3 hour layover. I was able to go to an awesome restaurant, Root Down, and sampled their Beet Down cocktail. Gin, aperol, beet juice, lemon juice, sprig of mint. It was essentially a lightly fruity negroni, and it was a great combination of bitter, sweet and tart. I’ve been thinking about making borscht recently, and if I do I may dig out the juicer and get a beet down of my own. All times are GMT -7. The time now is 11:04 AM.